Ny-Ålesund, the northernmost community of the world, comprises permanent stations of eleven research institutions from ten European and Asian countries. Especially during summer, it is populated by an interdisciplinary community of scientists investigating global change in the High Arctic. In 2017, our work group carried out a pilot study in the Bayelva River catchment near Ny-Ålesund, investigating CO2 fluxes from High Arctic tundra soils and their radiocarbon (14C) age. 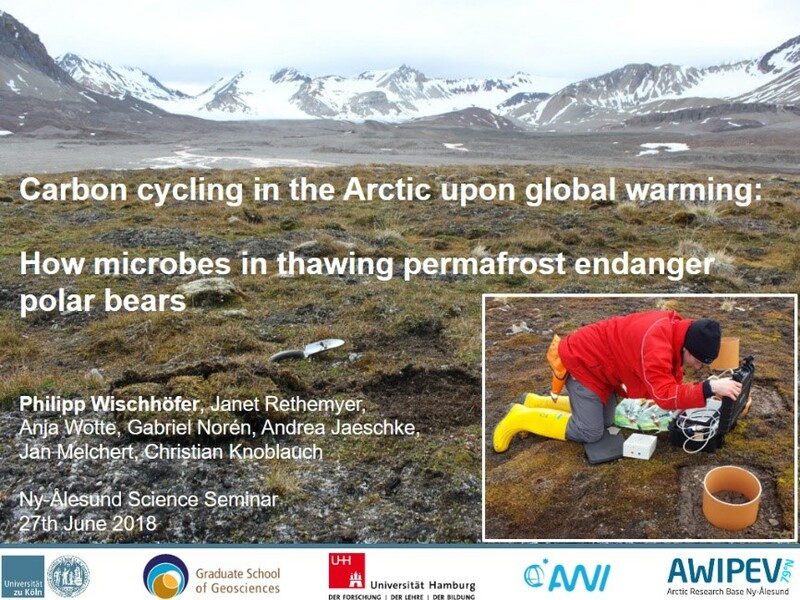 By comparing the 14C age of respired CO2 and of bulk organic matter within the active layer, the annually thawing soils above the actual permafrost, we were able to determine the contribution of old organic matter to microbial respiration. This old organic matter is of great concern with regard to global warming as its decay may trigger an additional positive feedback to surface warming by the release of the greenhouse gases CO2 and CH4. Thanks to funding by the GSGS, I now had the opportunity to present some results of this study, which forms part of my PhD project, at the Ny-Ålesund Science Seminar. As everybody in the audience conducted research in the area as well and thus had a strong topic-related background, the talk was followed by a long and lively discussion on the applied methods and the interpretation of the results. Hence, I got interesting input concerning the data and could at the same time promote our methods to the scientific community. The talk and subsequent discussion were a great opportunity to get to know some more people in the field and thereby extend my professional network. Furthermore, we used the time to repeat some of the sampling and measurements at the previously investigated sites. Thereby, I could train the handling of active dynamic respiration chamber systems and molecular sieve cartridges for the collection of CO2, improving my methodological skills. So my stay at Svalbard was a valuable experience for both my PhD and a possible future in science.